Sexuality and Spirituality: Can the Gnostic Gospel of Philip Bridge the Gap? 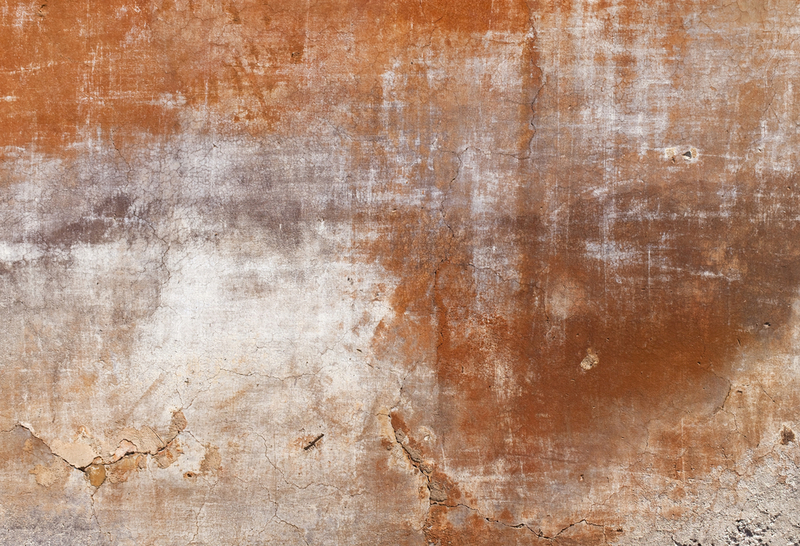 Spiritual but not Religious” What are today’s ‘New Pilgrims’ Looking For? Greek and Hindu Goddesses: Which One Are You? What Is the Gospel of Mary Magdalene Really About? Why We Still Go on Pilgrimages? Goddess News, Spiritual Blog, Divine Feminine, Dr Joanna Kujawa, Spiritual Detective :). I was thinking about all the possible topics for this month’s Goddess News newsletter (so many ideas!) but one thought kept coming back which came from a suggestion from one of the subscribers to ‘compare’ goddesses from different traditions. This is an immense undertaking and definitely can’t be done in one newsletter. However, it seems appropriate to discuss and compare goddesses that have been (or are) openly worshipped both in west and in the east. Although the focus of this newsletter is on secret and repressed traditions, we should also honour living traditions and see how we can add them to our lives. Here I have in mind the Hindu goddesses and the ancient Greek goddesses. Both have a very personal resonance for me that I would like to share with you. When I was a little girl, I was discontented with the images of what a girl/woman was supposed to be. I was never a girl who wanted to sit in a nice dress and wait for the hero to come back from his adventures. Don’t get me wrong – I liked the dresses, and I liked the boys, but I wanted my own adventures! I remember once reading a book about pirates that I had found in my grandfather’s closet, and at the age of nine I decided to be a pirate. It was a complicated decision because there were no pirate-girls around, and I wasn’t sure how I could do all the pillaging and travelling on a sailing ship in a nice dress yet command a respect among the bearded pirates. You see my dilemma? Fortunately, at the time my mum gave me a book on ancient Greek gods and goddesses. It was the discovery of a lifetime for me. In it were goddesses who didn’t sit around and wait for the gods to come back from their adventures. They had adventures themselves. I’ll give a brief tour of the ancient Greek goddesses. There was Athena – the goddess of wisdom; Hera – the goddess of the hearth and a wife and mother; Aphrodite – the beautiful goddess of love who had unending love-affairs and was certainly no virgin; and there was Artemis – the goddess of the hunt but really an adventuress and very independent goddess who preferred to live outdoors and create her own adventures rather than sit on Mt Olympus and polish her nails. There were so many to choose from – I was in heaven! As I grew up and became interested in spirituality, I began to be somewhat dissatisfied with theses goddesses because they were not goddesses of any conscience, and although they were immortal, they had absolutely no spiritual insight and could offer no guidance. This is where the Hindu goddesses come in. 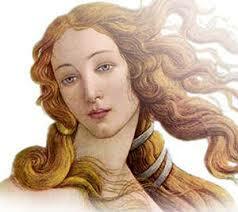 In many ways, they are very similar to ancient the Greek goddesses, as they occupy very similar domains. Saraswati, like Athena, is a learned goddess of wisdom but primarily of letters and music; Parvati is a bit like Hera the wife; Radha is the romantic lover like Aphrodite; Sundari is the sensual aspect of Aphrodite (often shown in a sexual act on top of Shiva); and Durga/Kali the tiger-riding goddess is a more powerful version of the adventurous but short-tempered Artemis. Except there is one significant difference – they have the spiritual insight, they have the spiritual significance. 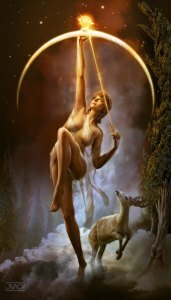 The goddesses of ancient Greece are like Hollywood stars, while the Hindu goddesses have a connection to the divine realm and their actions are focussed on the domain of the Self, of spiritual improvement, of reaching oneness with the divine. 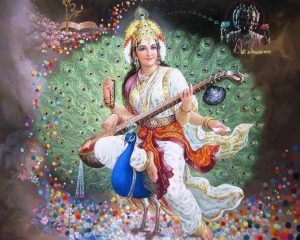 Saraswati studies the scriptures and her domain is sacred Wisdom; Radha is a lover but she is also a bhakti, as she represents the love and bliss of being within proximity of the divine; Sundari is sexual but also very powerful and uses sexuality to reach the divine. Thus, all of them share one purpose – to bring us closer to our highest spiritual potential through whatever gifts and means we have: intellectual prowess (Saraswati), heightened sexuality (Sundari), romantic longing (Radha), domestic chores (in a sense Parvati is the domestic goddess), the ability to create abundance (Lakshmi), and the ability to bring change even by drastic means (Kali). This is an oversimplification but with good reason. What does this all mean for us – women and men? Carl Jung, the Swiss psychotherapist and a rebellious student of Freud, thought that these kinds of primeval images are really archetypes in our psyche and they offer us choices and, in some circumstances, can also offer us guidance. Indeed, they can be used in deep analysis. So the question is: what goddess have you been unconsciously imitating in your psyche and consequently in your life? The same question applies to men as men can also be uncomfortably caught in a particular masculine archetype that do not serve them or testify to who they really are or aspire to be. Alternatively, what goddess have you been trying to unconsciously manifest in your life as a partner? The answer to these two questions (depending on your gender and sexual-preference) is very important. Why? Because if these choices were made unconsciously this is where your unhappiness with your life and your romantic choices lies. Once you identify your goddess – the one who you have unconsciously imitated or invited into your life – change her by bringing her to your awareness. This means you should now make a conscious choice, an aware choice within and without, in both your inner and in your outer life. Are you an activist, a ‘destroyer’ of old or outdated values that do not serve us anymore? A passionate fighter for a cause? If so, the archetype is Kali and you follow the principles of change and justice. Your goal might be to embrace everyone even the ‘enemies’ of the cause and experience oneness of all creation. Are you endlessly caught in romantic relationships that go nowhere? If so, the archetype is Aphrodite/Radha. You might want to uplift the romantic longing and ‘high’ to the longing for the Self because this is what you are really looking for on the deepest level – the oneness with the Beloved. Are you experimenting sexually? If so, the archetype could be Sundari and you are really looking for the beautiful principle of ‘Spanda’ – the feeling of heightened perception when you are one with another. 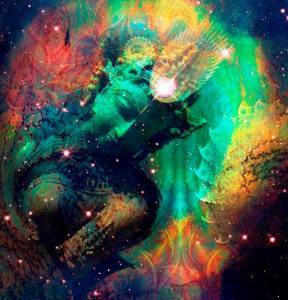 In Spiritual Tantra, ‘Spanda” is the very vibration of the Universe and its creative power. If you are a domestic goddess – the archetype is Hera/Parvati and you are like the Mother Earth. You might extend your divine qualities of carrying and compassion to all creation in the understanding that on the deepest level we are all one. Are you a talented visual artist or are capable of creating effortless abundance in your life? If so, the archetype is Lakshmi and you can use your manifesting talents to bring abundance and beauty to the world. Are you an adventurer and traveller – the archetype is Artemis/Durga? How can you bring the world together with your unique perspective of diversity and Oneness as a divine calling? This entry was posted in Goddess News and tagged ancient Greek goddesses, Archetypes, Artemis, Athena, Carl Jung, choices, Divine feminine, Dr Joanna Kujawa, Durga, everyday feminism, Goddess News, Goddesses, Hera, Hindu goddesses, Jerusalem Diary, Kali, Kundalini, Lakshmi, Meditation, Parvati, Rdha, Saraswati, spiritual, spiritual blog, spiritual blogger, spirituality, Sundari, women and spirituality, Yoga. Bookmark the permalink. 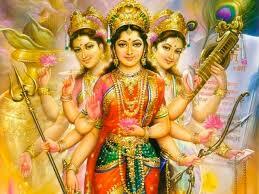 So interesting to align the greek and hindu goddesses! I loved the greek legends as a girl, amazing adventures & huge love stories, currently working with Kali, but, wonderful insights into aligning with different goddesses to engage different aspects. Hey Joanna… GREAT blog!! Thank you so much for going to such a lot of trouble on our behalf. I found everything you said to be of interest. (And most enlightening too.) What a lucky guy Shamir is!!! It’s conversation like this that inspires and supports, wonderful goddess energies, full of humour, grace and fire! Thank you Linda 🙂 I think that here, through Kathy, all goddesses have spoken all at once – glorious! Hey Joanna,this looks like it could be a wonderful adventure. I look forward to reading your other blogs and maybe even continuing the conversation. I went to a good presentation on the Black Madonna (something I know you are interested in) when I was in the US recently. I am very interested in sow goddesses, the Greek goddess Demeter was a sow goddess in her early pre Olympian form. By the time she became ‘civilised ‘ in the Olympian pantheon this had long gone though pigs were still her sacred animal and were central to the rites at Eleusis. Thank you for sharing the Goddesss-details of your recent trip to the US, Marie. Yes, the Black Madonna – a fascinating topic that I will write about in one of the blogs. I love when people tell me their ideas and interests. There is a very famous Black Madonna in Poland – one of my first short stories is about her but I did nto undertdand her then as she was explained to me in an orthodox way. I did not know the depth of her symblism then – something to write about in the near future. Who knows – perhaps we have the chance to discuss it in Brisbane in one hte future talks :). I think the concept, the idea of a Goddess is very deeply planted in us and is resurfacing with great power now. So much to explore! Enter your email address to subscribe to Joanna's blog and receive notifications of new posts by email.